East Yorkshire Motor Services Sports and Social Club, 1938. Homepage. 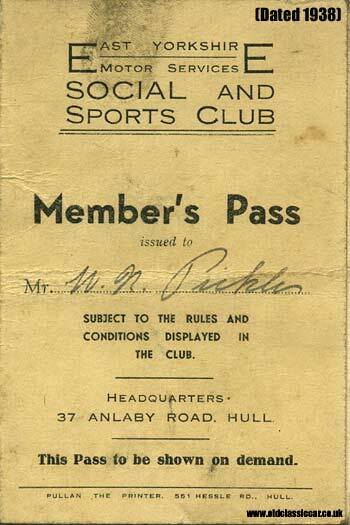 This page: A pre-war Member's Pass to the EYMS bus company's Social and Sports Club. This original membership card turned up in some old paperwork a little while back. Evidently Mr W. Pickles was an employee (perhaps a driver) for EYMS, or East Yorkshire Motor Services to give it its full name, a bus company operating in this county, based in Anlaby Road in Hull. A stamp inside this folded card reminded Mr Pickles that his subscription to the Social & Sports Club would be deducted automatically from his weekly wage packet, starting from 2nd May 1938. Perhaps surprisingly the East Yorkshire Motor Services bus operation is still alive and well, some 70+ years after this card was issued. Still based in Anlaby Road, EYMS now run a fleet of over 300 buses. Another welcome surprise is that they keenly support nostalgia and interest in the early days of their bus operations, more of which can be found in the Enthusiasts section of the EYMS website. In addition to all the modern buses that you'd expect to find in their fleet, they also run a number of vintage machines to use on special occasions, including a 1949 Bedford OB, a 1956 AEC Regent, a 1963 Leyland Titan and a 1964 Routemaster. Of most interest is a page showing some early photos of their bus operations, the earliest shown being a 1921 Ford Model T based bus - these photos can be found here on the EYMS site. Reference to East Yorkshire Motor Services is also found in a pre-war issue of The Leyland Journal, specifically regarding their preparations for the outbreak of war in 1939 - this page tells more about the Leyland magazine, and the essential wartime preparations that EYMS and others had to undertake. This site also features a copy of the East Yorkshire Motor Services staff magazine, for April 1948.